Three pay phones at City Hall Concert Hall... who uses them nowadays? I spied not one but three payphones while waiting in line for the washroom at City Hall Concert Hall last weekend. A 2016 news report says there are about 3,000 left around town. With everyone having on average two mobile phones, who uses these coin-operated phones anymore? OK so maybe you need the phone and have the coins, but do you remember the phone number you need to call? I don't. 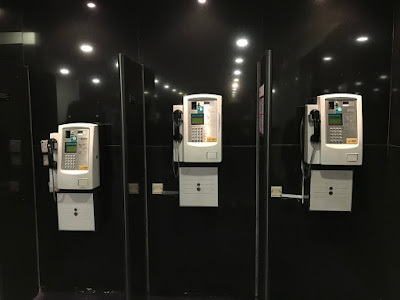 In any event Hong Kong still has a "reasonable number" of public payphones as required by the Telecommunications Ordinance, as public payphones are considered a "basic service" under the universal service obligation, which "should be made available to all persons in Hong Kong". However, the Ordinance doesn't specify what the minimum amount is. Stepping of the company bus one evening some years ago, I discovered that I had dropped my phone there. I quickly ran to a public payphone and called there, whereupon the friend I had been sitting next to picked it up and answered it, and made arrangements to return it back to me soon after. What a relief (to find a public payphone and use it)! You're lucky to remember your friend's phone number!